This cutout lace-up will add a dapper spin to your summer looks. 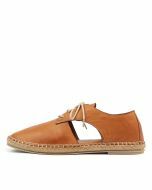 A European-chic design with a soft leather upper and blanket stitching details, the design gets a seasonal feel from its jute rope trim and cutout side panels. Pair it with slim pants and a slouchy white tee for an effortless weekend look.